This page covers the somewhat controversial act of motorcycle filtering, what it is, the legalities plus tips and advice for motorcycle riders who traffic filter. 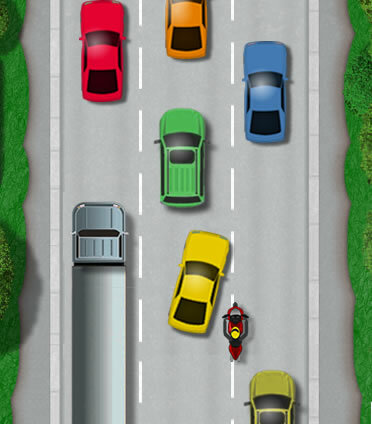 Motorcycle filtering, otherwise known as ‘lane splitting’ is essentially overtaking slow moving or stationary traffic in queues. Why Do Motorcycle Riders Filter? Those that do, generally do so simply to make progress. However, riders filter to varying degrees, with some to such an extent that they take every possible opportunity to do so. Others on the other hand, choose to stay within the general traffic flow and seldom filter. Riding a motorcycle does of course come with inherent dangers greater than those of motor car drivers and the like. You could argue that filtering escalates the potential for a traffic incident. However, other road users aside, it largely depends on the motorcycle riders attitude towards filtering, level of skill, awareness and experience. Riders that traffic filter can cause irritation to some road users. This could be due to a rider filtering particularly aggressively and causing a hazard, or simply because the driver doesn’t like the fact that the rider has gained an advantage by getting in front. There will always be drivers that suffer from road rage and will become infuriated over almost nothing. The thing to remember is to always remain within the law, to not become a hazard to others and to be courteous to other road users. Within the United Kingdom traffic filtering is legal within constraints. That is, the rider remains within traffic laws; no crossing double solid white lines, or crossing a single solid white line where the line is closest to the rider, where no overtaking signs are in force, on white zigzag lines at pedestrian crossings or using the hard shoulder on a motorway to filter. Traffic filtering also remains legal only when due care and attention is exercised by the rider. If traffic is moving at a sufficient speed that it is no longer classified as queuing, then as a motorcycle rider who is filtering, you may be on uncertain ground – legally speaking. In this situation, you are technically overtaking. As a rough guide, traffic moving at over 20 mph is not queuing. To a motorcycle rider, traffic filtering has its benefits. It allows you to progress through traffic at a quicker rate and for many, it makes the journey more exciting. Filtering when done safely and appropriately, is on the most part safe but still comes with increased risks. If increased risks isn’t for you, then simply don’t filter and stay within the traffic flow – queues n’all. If you do want to get ahead of the rest, you’ll need to filter. Detailed below are tips and safety advice that will help any motorcycle rider with little to no experience with traffic filtering. The most important aspect of filtering is to always stay fully alert, to observe and to be aware 360 degrees of your surroundings, to anticipate to the best of your ability road layout, traffic conditions and what other road users might do, and to plan your actions in advance. This will of course become easier with time and practice. Speed is also of great importance. The faster you move, the less time you have to react, slow down or stop. Car doors may open in stationary traffic or a driver may change direction without indicating or without seeing you. Things can go wrong and the faster you are moving, the more it’s going to hurt. Speed – The faster you travel the less time you’ll have to see a potential or actual hazard, slow down and/or stop. Stopping distances requires time to think and brake. A difference in speed from traffic flow of 5 to 10 mph will allow for a safety margin. This is based on a motorcyclist filtering in traffic that is moving no faster than around 20 mph. 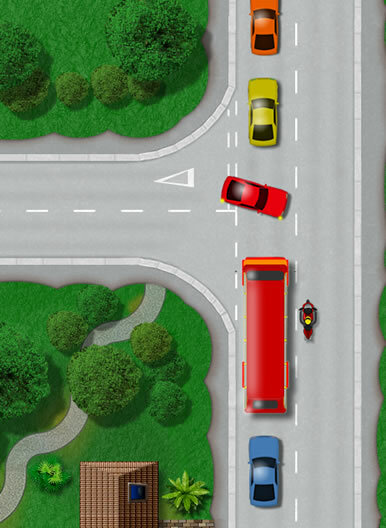 Junctions – Junctions represent the single most dangerous areas on roads for motorcycle riders. Motorcycles make up just 1% of all road traffic, though a staggering 19% of all road accidents involve a motorcycle – many of these are at or near junctions. These statistics aren’t the result of filtering, though filtering through a hazardous location will of course increase risks. A typical example of a high risk situation can be seen in the ‘Motorcycle filtering near a junction’ diagram. The high sided bus is obscuring a junction and traffic crossing ahead from the motorcycle rider. Traffic will often leave a gap in heavily congested areas close to junctions to allow other road users to make progress. Constantly scan from left to right for junctions up ahead and be cautious of vehicles exiting. Look ahead for signs indicating a junction and also for gaps in traffic which may suggest a junction is up ahead. Be cautious of filtering past a large vehicle which may be obscuring traffic crossing in front. Prepare for the unexpected – Don’t rely on other road users to do the right or legal action as other road users can be unpredictable. Never assume that a driver is going to signal or look in their mirrors before a change of direction or speed. In slow moving lanes with gaps, be prepared for drivers changing lanes into gaps between vehicles. When filtering, plan your route and if possible always have an escape route in mind just in case a road user makes an unpredictable manoeuvre. Always cover the brakes and be prepared to swerve, slow down or stop. Avoid lingering in another motorists blind spot as they are less likely to know you’re there. Traffic at at standstill – Stationary queues of traffic seems like a perfect scenario to make progress. However, be highly cautious of car doors opening, particularly where traffic has been stationary for a long period, typically due to an accident on motorways or dual carriageways. Drivers may exit their vehicle to stretch their legs or to try and observe what is going on ahead.Trouble is, they often forget about motorcyclists and are not expecting vehicles to be passing, so may not check mirrors before opening the door. In stationary traffic, either do not filter or keep your speed down to to a slow crawl to allow you more time to slow or stop, ride with dipped lights and reflective clothing to be seen. Road markings – Observe road markings in good time and avoid filtering in such areas. Solid, continuous white lines must not be crossed, except in an emergency and under certain situations. You can legally straddle or cross a continuous solid white line to enter a side road or property, to move round a stationary vehicle obscuring your side of the road, to overtake cyclists, horse or a road works vehicle moving at 10 mph (16 km/h) or less. Broken lines, where the line closest to you is broken can be crossed if it is safe to do so.Diagonal lines or ‘hatched’ road markings represent a hazard and may be surrounded by a solid or broken line, where the same traffic laws as above apply. Hatched markings are often used on the run-up to a central traffic island (something be avoided on a motorcycle). They can also be used in the centre of the road to help protect vehicles turning right. White zigzag lines represent a pedestrian crossing. Zigzag lines are used both sides of the crossing. You may overtake a cyclist, but must not overtake another road vehicle on the crossing or where zigzag lines are located. Front of the queue – At a busy junction or roundabout, you can as with many motorcyclists, filter towards the front. This doesn’t represent too much of an issue except for those vehicles at the head of the queue. Motorists at the front are concentrating on gaps in the traffic and will not be looking out for motorcyclists coming alongside. Filtering right to the front of the queue can see you slowing to a stop just as a motorist is pulling away, resulting in a collision.Assess each and every junction individually and do not make it a priority to reach the front each and every time. It can often be safer to stay back a vehicle or two from the front so that other road users know you’re there. Rear of the queue – The rear of a queue of traffic has its particular set of hazards. On a multi-lane road such as a motorway, drivers that are about to merge with a slower queue of traffic will tend to choose the lane that is the fastest moving or that appears to have the least vehicles in it.This often involves quick decisions that can result in a lack of effective observation. As a vulnerable road user who is less likely to be seen, it’s safer to remain in your current lane until the queues have settled before you begin to filter. Rear observation – Filtering requires a lot of forward observation and concentration. Don’t forget however, there’s other motorcycle riders on the road too. Some of which may be filtering faster than you. Check your rear view mirrors frequently so to ensure you know what’s happening all-round. Legal but unnecessary? – Whether it’s necessary or not is entirely your decision. That however may not be the opinion of your insurance provider. Insurance providers do not want to pay out in the event of a claim, and as such may refuse to accept liability as the rider was taking ‘unnecessary risks’. Of course each provider, policy and claim are different.If an accident is not your fault or there’s a degree of ‘grey’ area, you may be better off going through a accident management company. Essentially, a good company will take all the hassle out of your hands, deal with the case quickly and fees are paid by the company that is liable. General Tips – Always think is it necessary and is it legal? Ultimately, filtering on any level does increase the risks of an accident. Some bikers filter, some don’t. If you don’t feel entirely comfortable doing it, then don’t filter. Yes filtering does enable you to progress faster, but you’ll likely just be saving a few minutes off your journey time in most circumstances. If you do filter, or intend on doing so, do so at a speed and rate that you feel confident and capable of and that allows you safety margins.Don’t feel pressurised by other riders who filter faster than you to increase your pace, just let them pass. Try to be polite and courteous to other road users, particularly those that go out of their way to let you pass. A little ‘thank you’ gesture goes a long way and will often result in road users being courteous to you again or other bikers. You must read the road and other traffic all around, look well ahead and plan your actions.